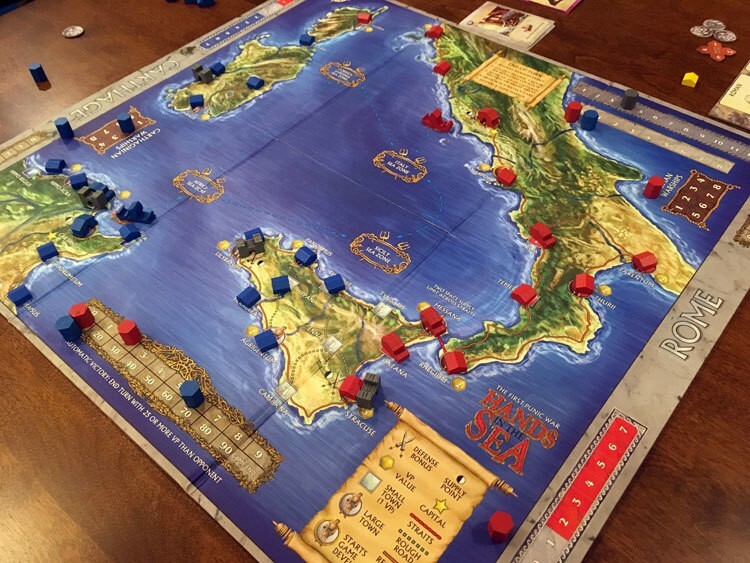 We review the two player war game Hand in the Sea. 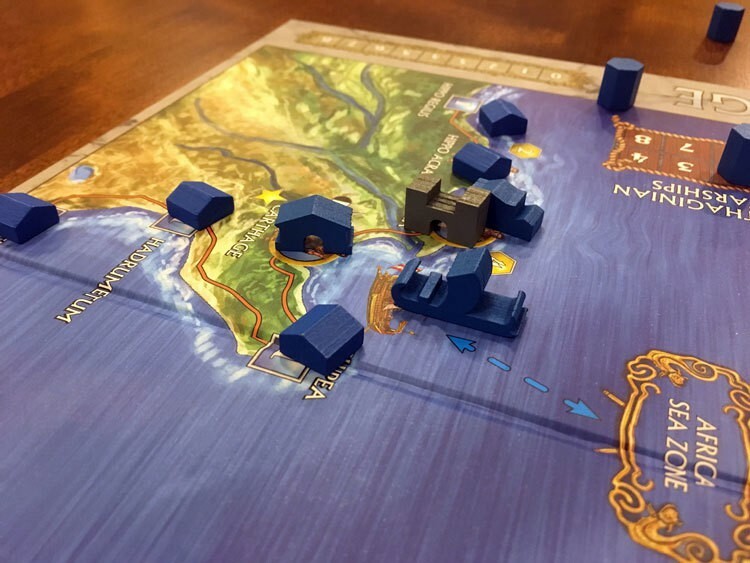 Built off the foundation laid by Martin Wallace's A Few Acres of Snow, Hand in the Sea transports players to the classical era as Rome fights Carthage for dominance. Way back in 2011 CE, designer Martin Wallace developed a game called A Few Acres of Snow. The goal was to bring a deck building and hand management mechanism to a war game. The setting for the game was the English-French War in the mid-18th century. Britain and France collided with infantry, cavalry, and native mercenaries for control of the North American continent. The game was well received and won a few awards. Sometimes in board gaming circles, a designer copying another game’s mechanics verbatim may be seen as lazy, but in war games, if you find a formula that works for simulating the chaotic nature of control vs conflict, you copy it. Daniel Berger and Knight Works have done just that in their latest offering. 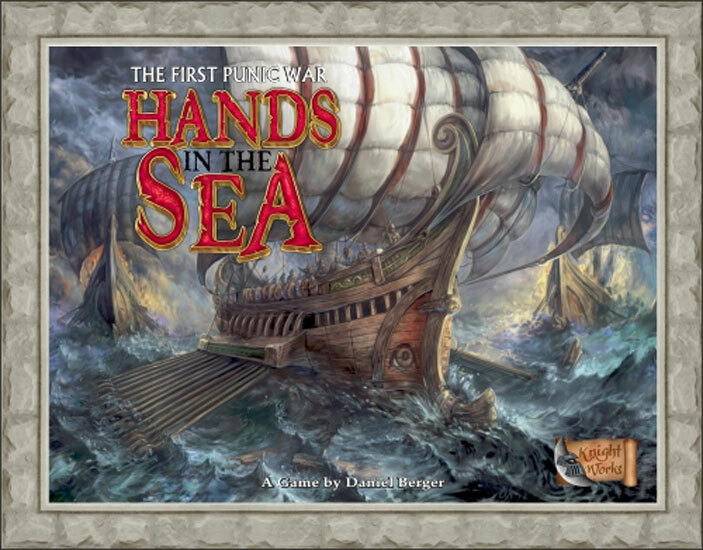 Hands in the Sea is a card management, deck building, and war game for 2 players that takes 90-120 min to play. Punic Wars. What are they good for? Board games. I’ll say it again. 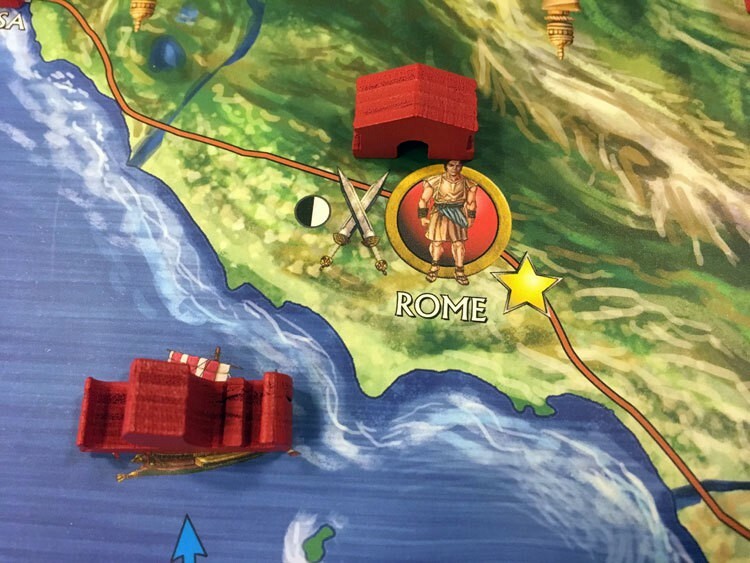 The players represent the conflicting forces of Carthage and Rome fighting throughout the Tyrrhenian Sea for control of Sicily, Corsica, and Sardinia. Players can win outright by a variety of means, but if a game end condition is met, victory is adjudicated by victory points. The symbols on various cards control the actions available to players. Funded on Kickstarter, Hands in the Sea contains a variety of quality components, especially if gamers receive the Kickstarter bits. Ships, town/city markers, and capital buildings are represented with miniature wood structures. The various cards are of decent quality. The board art is nice with strong primary tones without subtlety. A couple of cards have slightly confusing graphic design and the clarity of some game functions could have been improved with new icons, but overall the graphic design is solid. Then there’s the rulebook. The first major consideration is that there is a second printing of the rules with quite a few edits available online. The layout and structure of the rules, while containing all the content, is not eye friendly and creates headaches for a first read, especially if gamers have no experience with A Few Acres of Snow. By comparison, the rules for its predecessor are laid out much more cleanly. Players who are struggling with the Hands in the Sea text should take a cursory read of the shorter A Few Acres of Snow rules for clarity. Setup involves preparing a few tracks on the board, placing starting building locations, taking money, and laying a variety of card decks. Once complete, players draw an opening hand of five cards. Each player turn boils down to taking two actions, then refilling a hand back to five cards. Those two actions are at the crux of everything in the game. In addition, once the Carthage player runs out of cards in their draw deck, a maintenance phase occurs where a random event is resolved and players receive money and interim victory points. Settle a Location – Occupy a new town by playing the required cards and place a new town piece. Develop a Location – Upgrade a town to city by playing cards and placing a city piece in place of a town. Fortify a Location – Play the required cards and pay money to create a fort on the town or city. Build a Warship – Play the required cards and advance your number of warships using a track. Take Money – Play a card for its indicated money value. Merchant – Play the merchant/mercator card and discard wine cards gaining 2 money/card. Trader – Play a combination of cards and take money equal to their money value. Pillage – Play ship cards to ransack a nearby city, stealing money from the opposing player. 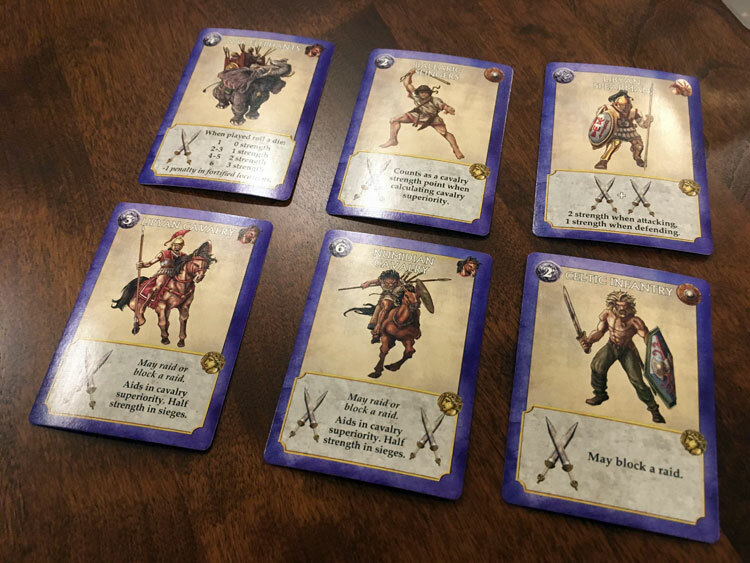 Ground Attack – Play required cards to use military cards (swords or boats) to take over towns/cities. Naval Attack – Play a ship to attack the opposing fleet. Naval combat is resolved using dice. Reinforce a Ground Attack – Play a card to aid in an ongoing battle. Cavalry Raid – Play a military card that can raid the opposing player. The opponent loses a town or a city is downgraded to a town. Bribe Mercenary – Play a required card to remove bribable cards from the opponent’s hand or reserve (see below). Purchase a Card – Each player has their own deck for purchases of new cards. This is paid for with money. Discard Cards – Remove cards from your hand to the discard pile. Each card beyond the first costs money. Return Cards to Personal Deck – Cull cards from hand back to the deck. Reserve Card – Place one card from your hand in a personal holding space for a later turn. Purchase Strategy Card – From a common card row, players may purchase Strategy cards as an ongoing upgrade. A player can have only 1 of these at a time. Cycle Strategy Cards – Discard cards from the common card row so that new cards are revealed. Sea Move – A player may move their warship token to an adjacent sea zone if they have warships. Withdraw – End an ongoing battle. Pass – Do nothing else but collect one money. As is clear from the number of actions above, this game requires some investment committing these actions to full understanding. For a full rules explanation, the available online manual is required reading. It comes across as dense, but it’s also difficult to explain every avenue of the rules in this short article. A common strategy is for Carthage to push early into Sardinia. Of all the games that this reviewer has played, this was the first game that caused reflection on what the word “complex” means. Merriam-Webster defines it as “consisting of many different and connected parts.” However, what often comes to mind when the word complex is mentioned is “difficult to learn”. This is and is not the case. Hands in the Sea takes effort to understand, but does not take any more intelligence than any other medium weight game. This complexity in both game mechanisms and density of rules is rewarding, but it does take some effort. The main content that deserves reviewing in Hands in the Sea is how it deviates from or improves upon A Few Acres of Snow. Like the predecessor title, the game follows a path where players spend many turns building up specific cards in hand or in reserve. Once the time is right, cards are retrieved and a major game move (usually an attack) is made. Other times, simply harassing or denying an opponent opportunities through raids or pillaging is the objective. This pattern allows for players to strategically craft missions and objectives for themselves to accomplish. It’s unique and interesting, but fans of faster paced deck building games might not see it that way. Symbols in Rome denote it as a home city as well as requiring a colonist to be conquered. The major additions over A Few Acres of Snow are the rules for Sea Zones, Naval Battles, Strategy Cards, and Supply. This could almost be considered a retheme with an additional expansion because the game handles it beautifully. Piracy-inclined players will find that pillaging requires a naval fleet to be close to the coastal city. This is also a necessity due to the retheme which has many more coastal cities than A Few Acres of Snow. Since fleet location is now of importance, battling naval fleets also enters the picture. It could have been more elegantly implemented than with just dice to fight a battle, but the repeated investment in number of warships helps mitigate the random nature. It also adds strategic considerations over the whole game. Strategy Cards seem to exist solely for the purpose of allowing play to dynamically change, but it also has the bonus of engaging player interest in their strategy. Players can set themselves up for more focused actions, but players also have to know when to change out their strategy card. This mechanism makes the game feel different from play to play as players can explore the nuances of different cards. 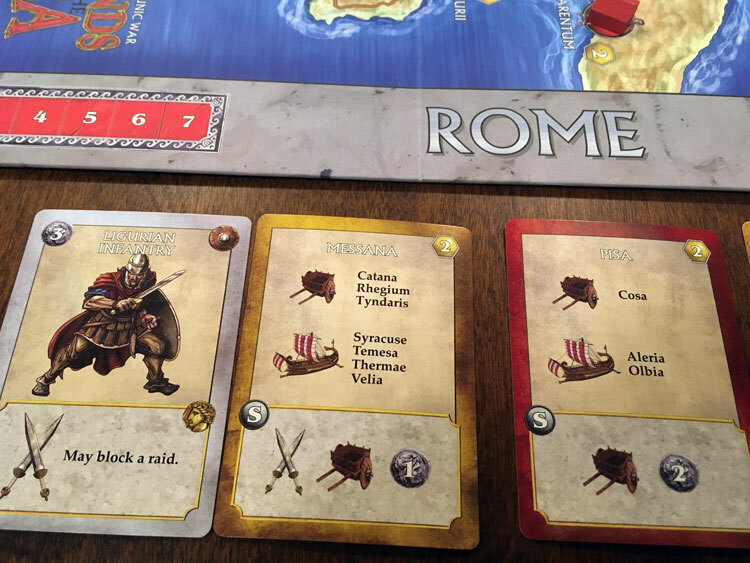 The Carthage player has access to more mercenary units than Rome player, identified by the coin symbol on the right side of the card. The addition of supply lines also has huge and welcome ramifications. Because towns depend on supply connections, attacking a crucial point has an impact on the opponent’s ability to use cards. This is a great introduction, but also adds to the complexity of play. Again, these layers are interesting, but the additions push the game away from introductory fare and more towards experienced gamer consumption. Over the course of a game, a grand story arc of a historic war definitely comes alive. The narrative writes itself and the theme comes together beautifully with the actions of the players. However, this is also where some negatives come up. With so many options and because of the selected theme, the terrain leads the conflict to develop in a particular way. At a point, the game can feel as if an end is a foregone conclusion and needs to be over sooner than the game end conditions allow. The first major zones of conflict that players will fight over are Corsica, Sardinia, and Sicily. Depending greatly on player actions and focus, some games can feel like a slog as raids and attacks do little to gain ground for either side. Only if a player is unprepared for attack will an opponent cover ground quickly. This is where rules for supply and getting the right attacks to succeed become important, especially if locations have been raided or are out of supplies (which become dead cards in hand). This part of the game can become frustrating; it may not be the experience some are looking for. Houses denote control of various towns, the longship is used to control sea zones, and the grey archway indicates a fortified location. The final and most significant negative is the inclusion of Event cards which are drawn for each round. This is a hackneyed and woefully arbitrary mechanism. Very few games deserve the punishment of Event cards, and the impact of the events in Hands of the Sea is game breaking at times. If it is possible to play without them, that would be this reviewer’s preference for every single game. At no time were they enjoyable. Even players who benefit from them can feel cheap due to the advantage. Some games reward players the more effort and experience they put into it. Hands in the Sea is one of those games. Building confidently on the foundations of A Few Acres of Snow, it introduces a classical era war theme and develops Martin Wallace’s concepts with additions and new mechanisms that take it to a whole different level. Players who enjoy deck building and hand management as mechanisms should definitely take a look for deep strategy in a departure from common war game forms. Gamers familiar with area control and deck building can also find new ground to explore here. Hands in the Sea is a worthy offering that rewards players with each play, as long as they overlook the annoying Event deck. If you’d like to pick up a copy of Hands in the Sea, you can get it for $60. 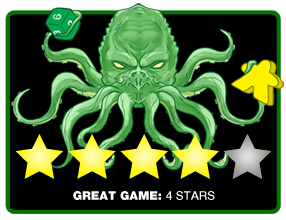 Final Score: 4 Stars – While not overly complicated, it does take some study. However, once this is done, the game blossoms and the engagement level is high.